The SADF (the old South African Defense Force) is for many, an unusual subject, especially for those accustomed to the ordinary subjects of modern western armor and softskins linked to contexts of NATO and some French designs. Still, being an African born man and Portuguese, it was great for me to find models being produced by Bax Mod Models of some of the machines that I knew all too well from TV and reading material, linked to the conflicts in Namibia and Angola. One of these vehicles was the Buffel (buffalo), that represented in comparison with America or Europe something like an M113 or a VAB. It was, along with the Casspir and the Ratel, the standard APC for the South African forces since the middle of the 70s and played an important role in the constant engage and disengage type of operations played in the southwest African "Bush War". As with the Casspir, the Buffel's best trademark was its mine protection technology, although it became a sort of a mite with time, these types of vehicles were thought of for the APC/IFV role with the inclusion of mine protecting tech, representing in the end, a new trend in APC concept. Starting out, if you are looking for a small scale model with "persona", you got it. Just taking in the "look" of this small guy is great, the vehicle is funny in a number of ways, being very small and unusual for an APC and somewhat of a leggy thing. The smallness of the kit makes for a fun build with some very thin and delicate parts. 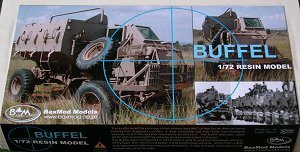 In general the Buffel is very close to the Samil 20 light truck also previewed here by Doug. 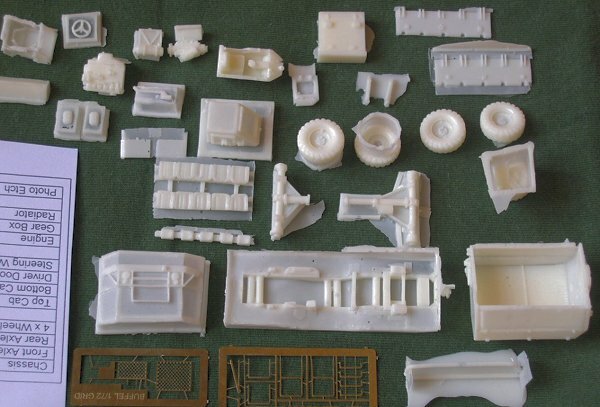 Upon a first look we see lots of flash, this is a result of the method of casting as was with the Samil, still its easy to clean up and get your parts ready for assembly. Some air bubbles are found here and there being easily corrected with some putty. The detail is present, clear and abundant, with the finer parts coming in the form of two sets of etched parts. 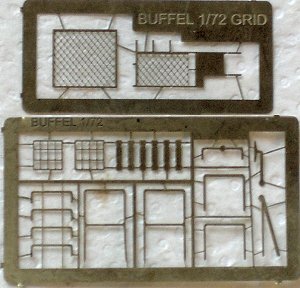 Alternatives are suggested for making some of these parts, like the use of wire and plastic rod for the making of grids and mirror mounts. 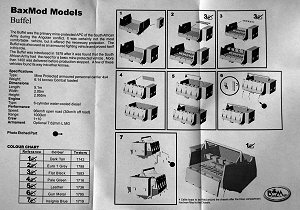 In this case the instructions are also clear and helpful, going very much against the trend of resin models which in general, provide sparse instructions. A check list of parts is provided and the proper instructions are clear in step by step assembly. As items that probably could be considered missing, are markings for an original SADF version and other versions in use in other parts of the world, and some clear plastic or an acetate sheet to replicate the windshields on the cab. The first is not a big problem and in keeping with my philosophy, I started a long time ago to paint, yes paint, my markings on vehicles. Being someone that builds a lot of Israeli and Arab machines, I found that it was very hard to find transfers for my kits. The problem consisted namely in understanding the numerical concept behind the numbering and marking of any type of machine. So being a good archaeologist that I am, I started out looking to understand the contexts in which the machines were in, after that it was easy, you only need to find good graphical reference material, just about anything works, photos, drawings, line drawings, anything. The second problem (lack of clear parts) is resolved in much the same way as the first, you need to improvise, which is by the way the big fun behind this hobby for most of us. So if you dont have clear plastic or its harder to get, try acetate sheet, you can probably find it in a dozen places and in the end its very easy to work with. As a reference guide the only help is the color photos in the box cover, providing some 3 to 4 pictures of the vehicle. Having seen so many times this guy on TV, actually moving, I feel more reference is probably needed for those not accustomed to SADF subjects. You can resolve this problem in a number of ways, the first is paperback reference, trying to find books on this particular subject or the SADF in general, still it presents itself as costly, timely and difficult because the subject is not too common. Second you can try the internet, start by Bax Mod Models web page, theres some photos present and some historical background also. Also a search on google with the name of the vehicle also helps with the reward of a very good number of pages on the subject of this particular vehicle. Lastly you can search on particular sites that refer to military equipment and have plenty of historical background and graphic reference material, being photos, line drawings and so on. On a final note I would like to stress two aspects that seem important. This preview is, even with all goodwill, an appreciation made by someone who has some years of experience with model kits and in particular with resin ones. This should not constitute a personal overstatement of my personal expertise in model making, I build kits for fun and thats it, no model contest winner here; I started building kits saying this and Ill die saying it. What should be understood and so many times is not, is the fact the this model kit may be great and fun for me to build, but it may prove difficult for any other given person out there. Resin may not be so familiar, or the way this type of resin is cast may prove challenging to some, it all depends of you. For someone who likes those moments in which we sometimes find ourselves improvising and ask, "how the hell am I going get over this now", this model is for you, it has all of the companents for good fun and a pleasing end result, it all depends of how much we put in it.